We now have two edited versions, a full length version and a shorter version of the original film, which may be more suitable for people who do not have a connection with the estate. We also kept a diary of the project which you can see here along with some additional interviews with Neave Brown not included in the film. You can download the accompanying booklet by clicking the picture below. 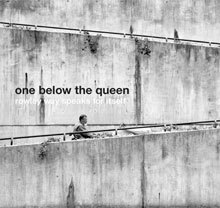 May 2015 is the 5th anniversary of the premier of "One Below The Queen". Over this time the film has been seen by tens of thousands of people across film festivals, exhibitions and on the internet. To celebrate this the Tenants and Residents Association on the Alexandra and Ainsworth Estate is planning a celebratory screening on the estate accompanied by a discussion with architect Neave Brown. Details to follow. 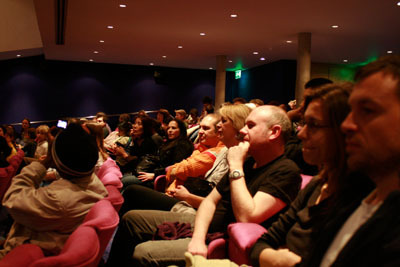 The film was launched on 15th May 2010 at The Tricycle Cinema in Kilburn. Over 200 people came along, a mix of residents, architects, people involved in the construction of the estate (including Neave Brown), councillors and other interested people. To see photos from the launch and read more click here. The film was shown in 2011 as part of the exhibition "Creating a Piece of City: Neave Brown and the design of Alexandra Road" at Holborn Library from Tuesday 10th May until Friday 22nd July, 10am to 7pm. More info at www.londonarchitecturediary.com/event.php?id=2560. This exhibition is due to move to Bristol in 2012. Watch this space for more info. The film was shown at the Portobello Film Festival in September 2010. The film formed part of an exhibition at the New London Architecture Gallery from 30th October to 27th November 2010 on the work undertaken in Camden under Sydney Cook. Details here. September 2015. The film is being shown on a loop all morning as part of the Open House London weekend. Anyone coming to look at the two properties open on that day are welcome to come up to the Tenants Hall for a cup of tea, to meet residents and have a cup of tea. More info on the estate website here. Between November 2009 and April 2010 a group of residents living on the Alexandra and Ainsworth Estate (often know as Rowley Way) in NW London worked with the arts and education charity digital:works to make a documentary film about their estate. The incredible Grade II* listed building features frequently in TV dramas and architecture journals and the intention of the film was to give residents themselves the opportunity to explore the ideas behind the estate and how it works. They met and interviewed the architect Neave Brown to discuss his ideas, hopes and intentions when he designed the estate and also to get a sense of the culture and politics of the time it was designed and built. They also met and interviewed landscape architect Janet Jack and chief engineer Max Fordham. After this they interviewed numerous fellow residents to examine people's actual experience living on the estate. Resident Matthew Rosenberg and his colleague Sav Kyriacou, both participation workers with digital:works, set up and coordinated the project working with 11 fellow residents to make the film. digital:works ran workshops in which the group discussed and decided on the direction of the project and then learnt practical film making skills, operating the camera and sound, and also interview techniques. Over the following 12 weeks the group broke up into smaller units and went out and interviewed 35 fellow residents across the estate aged 3 to 103 as well as Neave Brown, Janet Jack and Max Fordham. These interviews are all included in the film, along with scenes of the estate. The soundtrack is also from the estate, composed and recorded by a resident musician, Huck Whitney. The result is an exploration of the estate, by people living on it. "Rowley Way Speaks for Itself!". Marcel Braithwaite, Seamus Deichunty, Ann Franklin, Abdullahi Hassan, Stephen Herman, Jack Kelly, Tiffany McGee, Phil Oman, Doreen Parker, Amin Saatchi. Please note! The estate is officially known as the Alexandra and Ainsworth Estate. 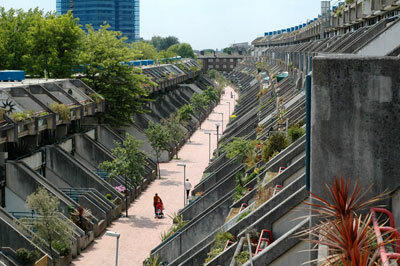 Rowley Way is actually just one section of the estate, and many people incorrectly call the whole estate by this name. When discussing the name for the project, the film makers felt that because many local people know the estate as Rowley Way it would be okay, and a catchier title, to call it Rowley Way Speaks for itself. So apologies to those of you who are irritated that the estate is constantly referred to incorrectly! And journalists and architects please take note. A big thank-you to the many many residents who responded so enthusiastically to the idea of the film and to all those who agreed to be interviewed. The film was launched at the Tricycle Cinema on Saturday 15th May and the whole estate was invited. 230 people came and participated in a Q&A with the film makers and architect. Following this, a DVD of the film along with a booklet with images and a history of the estate were delivered to each household of the listed buildings. In 2012/13 a group of residents put together a bid to the Heritage Lottery for funds to bring the park back to it's former glory. This involved lots of hard work but it paid off as the bid was successful and residents have raised over £2 million for the park. Work has recently been completed and the park looks beautiful. It's open to the public and the estate is accessible so do feel free to go and have a look around. The Tenants Hall, which was underused at the time the film was made, is now in constant use by the community with yoga classes, table tennis clubs, a fresh fruit and vegetable food coop, parties, meetings and more. Residents also recently spearheaded a move to improve the garages which are now much better lit, patrolled and used. So the community itself has become increasingly active and engaged. Find out more by visiting the estate website. We kept a diary of the project which you can see here along with some additional interviews with Neave Brown not included in the film. Residents on the Alexandra and Ainsworth Estate have built their own website with information about the estate. It contains a gallery, history as well as information on what is going on there. Click here to see it. "Sometimes an Indie film lands in my DVD player whose strengths are apparent but hard to define. I had such an experience this week after watching One Below The Queen: Rowley Way Speaks. It includes interviews with Camden Council’s architect Neave Brown, who built many of the borough’s much-loved social housing projects, and tenants. It is truthful about life on the estate, full of praise as well as never being afraid to hide from the issues. It is beautifully shot by resident Matthew Rosenberg and other people who live there. But above all it left me with a sense of what it means to be part of a community in 2010, and somehow has touched on so many of the facets that subconsciously make up our city today. It is inspiring. See next week’s Review for a full feature on this incredible project"
"The film is the exhibition's highlight. It splices candid residents interviews with footage of the estate. One is left with a vital impression of hanging gardens and light filled interiors, the nightmare car access but cheek-by-jowl neighbourliness, the grey concrete and poor sound transmission, yet a sense of stability and comfort." "I just wanted to say how fantastic I thought the film was. I went to the film showing at Kilburn and found it incredibly moving as well as informative and interesting. I was really blown away by it. And it's great to have the dvd." Penny Wiles. Resident, Rowley Way.